Super-rare Pokémon Victini saw a limited release when Pokémon Black and White earlier this year, and now the little monster is rested and ready to make another appearance this weekend. From Saturday, Victini will be distributed via Nintendo WiFi Connection, complete with a pretty powerful move set: Fusion Bolt, Fusion Flare, V-Create and Searing Shot are all in the Victory Pokémon's arsenal, all made even stronger by the Fire Gem resting in its little paws. For instructions on how to receive Victini in your copy of Pokémon Black Version or Pokémon White Version via Nintendo Wi-Fi Connection service, go to www.pokemon.com. Wireless broadband access is required for this distribution. For more information on accessing Nintendo Wi-Fi Connection, go to www.support.nintendo.com. There's also a limited two-day theatrical run of Pokémon the Movie: White-Victini and Zekrom this weekend, making it a double-whammy of pocket monster action to kick off December. BELLEVUE, WA - November 28th, 2011 - Pokémon™ fans can enjoy a special Victini "double feature" this weekend. Starting Saturday, December 3rd, Pokémon Black Version and Pokémon White Version video game players can receive the Victory Pokémon Victini in their game via a special distribution, and discover it's ready for battle with a set of very powerful moves! Coinciding with the Victini distribution's launch is the U.S. theatrical debut of Pokémon the Movie: White-Victini and Zekrom, in theaters for only two days, Saturday and Sunday, December 3rd and 4th. To ensure you're a part of the historic Pokémon the Movie: White-Victini and Zekrom theatrical event at more than 375 theaters nationwide, go to www.pokemon.com/moviewhite for a link to show times and locations. From December 3rd through Saturday, December 31st, a Level 50 Victini will be available for Pokémon Black Version and Pokémon White Version players via Nintendo® Wi-Fi Connection service. This Victini has an unbelievable move set, including signature moves of Reshiram and Zekrom: Fusion Flare and Fusion Bolt! Victini also knows V-create, an immensely powerful Fire-type move, and Searing Shot, another Fire-type attack that hits all other Pokémon in most battles. To cap it off, this Victini holds a Fire Gem, which provides a one-time power boost to one of Victini's Fire-type moves. Obtaining this special Victini will add star power to your Pokémon team! @fpssoviet Yep, even if you got Victini first time around there's nothing stopping you from getting this one as well. Also, finally another Black/White distribution. They're a bit thin on the ground outside Japan, I'm sure this is only the second. Yes! I missed my chance to get the liberty pass. Just gotta make sure I can get some free Wi-fi before December ends. @2 It's only the 2nd legendary giveaway outside Japan (after the first Victini), but there's also been an Eeveelution, Banette, Croagunk, and a random egg containing either a Pidove, Axew, or Pansage. @2 and 4 - Don't forget the Toys R Us Zoroark. @BulbasaurusRex Good point, I forgot about all the Global Link promotions. They've been excellent thus far as well. I don't know why Nintendo is wasting money on even a limited release of the newest Pokemon movie in theaters. The core games are still popular in the USA but everything else connected to the franchise has fallen massively since the late 90s when Pokemon first came out. There are going to lose money on this. 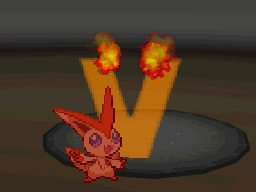 On 2nd thought, nice for Nintendo to finally release the V-create Victini, as that's the move that really helps it stand out among the various other fire pokemon. The first Victini was already on Black and White (but required a liberty pass to unlock it) and it didn't have V-Create. I'm thinking of getting this game but i don't no witch one to get. Will it work on a 3DS ? @9 Yes, all DS carts also work on a 3DS. As for which one to get, you should take a look at this list of exclusive Pokémon. @10 Yeah, it's an awesome moveset. I'll switch out Searing Shot for Psychic, but the other 3 moves will be here to stay on mine. This is prefect, I could always use a second legendary pokemon, that won't be used in battle and it's nice to see it's not Japan only. So much for the exclusivity of the Liberty Pass. So will I now get a Pokemon ambassador reward? At least Nintendo kidded us longer than with Super Mario All-Stars. People are still playing Pokemon Black + White? ._. @16: Thanks for the info. My apology to the Big N.
victini..... yay? why don't they give other pokemons? like genesect or the two other unreleased pokemon? I'm kind of tired of victini ._. Can you go on wifi on a 3ds ? Great!I plan to get Victani because last time I didn't have WiFi on my Dsi.